They sacrifice their lives for others. They are at the front lines, physically, financially, logistically and emotionally, but are often in the shadows socially. They protect the lives of the most vulnerable, and in the process also become vulnerable. They are the soldiers that bravely confront one of the toughest battles in life that affect a growing number of people world wide. They are the caregivers “sandwiched” between caring for their children and caring for aging parents, or “sandwich generation” caregivers. As I mentioned earlier, expats, global nomads or adult Third Culture Kids in caregiving roles face even more complex situations than non-expat caregivers and as such”sandwich generation” adult TCK’s or expats likewise face unique challenges that deserve recognition. The plight of “sandwich generation” caregivers has increasingly become more well known over the last two decades, which witnessed the inclusion of the term in the Oxford English and Merriam Webster dictionaries in 2006, attributed to the work of Joy Abala in the United States. (Her heart behind her work is very similar to mine! It was great to discover her while preparing for this particular post. Read about Joy Abaya’s story here). In the U.S., July is recognized to be Sandwich Generation Awareness Month. 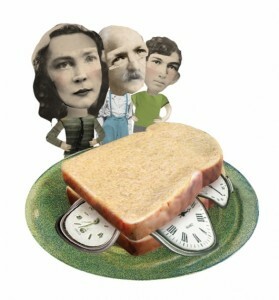 Around the world, there have also been some recent discussions about the sandwich generation. In Britain, there is a surge in the number of people living in large households because of the “sandwich generation,“ only about two years after the emergence of “sandwich generation” households in studies were noted and expected to continue. The common issues that “sandwich generationers” deal with range from the financial crisis of rapidly depleting income while supporting three generations of family members, to the emotional toll that come with sudden major life changes and multiple losses (ie. 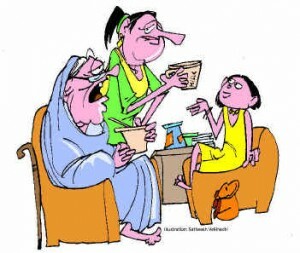 of the caregiver’s career options), to the stresses of watching loved ones’ health statuses decline to the point of dependency, to the drastic tips in the balance of a caregiver’s circle of support, where she/he receives less and gives more, especially when a loved one’s health progression leads to the caregiver’s increased isolation. A “sandwich generation” caregiver with a current or dormant globally mobile life faces even more complex issues not just due to the distance between family members that is often a default with expats, but also due to the experience being part of a globally mobile family. Expats face the potential risk of having no safety net of support and resources at the point of retirement, if expats choose to retire in a country other than their passport or host country to be reunited with their adult children or to settle where they have the most friends and/or relatives. 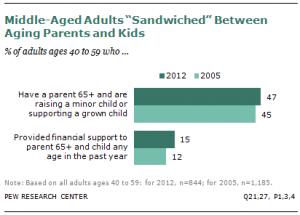 This creates the context for how a “sandwich generation” caregiver supports her/his parents. This in turn can impact the caregiver’s own retirement and financial planning for the future. Adult TCK or expat “sandwich generation” caregivers may have less support than non-TCK or expat counterparts. Not only may the caregiver be going through this major life change away from friends she/he has established, but may also be wrestling with the question of belonging and sense of isolation common to Third Culture Kids (TCK’s) that the standard support group and average counselor is not prepared to fully support. The “sandwich generation” caregiver may also still be in the process of working on her/his journey of addressing unresolved grief and multiple losses throughout childhood. If she/he has not even begun it yet, it can be triggered by the mere act of having to relocate to adjust to the parent’s needs because it can closely resemble the pattern of moving for a parent’s career. 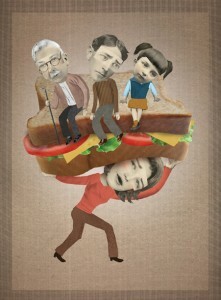 Taking on the role of being more of a “giver” than a “receiver” of emotional support can place a “sandwich generation” caregiver who grew up as a TCK at risk for an emotional breakdown, depression, unhealthy coping mechanisms to stressful triggers, psychosomatic health conditions and other factors that can end up as a statistic void of any connection to the deeper journey behind it. Remember that much of the experiences of TCK’s is still largely unknown, misunderstood or misdiagnosed by counselors or support figures who simply don’t have a deep understanding of the effects of a globally mobile childhood. In the past decade, international schools have begun to acknowledge and/teach about the experiences of TCK’s. Programs for military families in the U.S. for example, are now beginning to broaden their understanding of what military children experience. However, for the most part, until TCK’s themselves take on more leadership roles and are in the decision making positions about programs and resources for TCK’s in various age groups, it is simply not enough. The traditional training available for social workers, grounded in similar human development theories used in training for psychologists and counselors, all of whom would serve as mental health resources for “sandwich generation” caregivers is predominantly based on mono-cultural systems and is therefore not fully equipped to help the adult TCK’s or global nomads of this population. This is where we as individuals, especially TCK’s, other expats and nomads, can step in. The support for “sandwich generation” adult TCK’s or expats can also come from amongst one another. While financial planning, counseling and other professional services can be provided by specialists, it does not require a specialist to reach out, understand or offer support to a “sandwich generation” expat or adult TCK. “Sandwich generationers” are on a very challenging journey that they chose to accept out of a deep tremendous love for their family members. Caregivers, especially those playing the dual roles of parenting and caring for their own parents, deserve to be honored as valuable and crucial members of society and supported in any way possible.